We’d love your help. Let us know what’s wrong with this preview of To Live and Think Like Pigs by Gilles Châtelet. Gilles Châtelet’s scathing polemical tract opens at the end of the 70s, when the liberatory dreams of ‘68 are beginning to putrefy, giving rise to conditions more favourable to a new breed of self-deluding ‘nomads’ and voguish ‘gardeners of the creative’. Gulled by a ‘realism’ that reassures them that political struggle is for anachronistic losers, their allegiances began Gilles Châtelet’s scathing polemical tract opens at the end of the 70s, when the liberatory dreams of ‘68 are beginning to putrefy, giving rise to conditions more favourable to a new breed of self-deluding ‘nomads’ and voguish ‘gardeners of the creative’. Gulled by a ‘realism’ that reassures them that political struggle is for anachronistic losers, their allegiances began to slide inexorably toward the ‘revolutionary’ forces of the market’s invisible hand, and they join the celebrants of a new order governed by boredom, impotence and envy…. As might be expected of Châtelet—mathematician, philosopher, militant gay activist, political polemicist, praised by contemporaries such as Deleuze and Badiou for his singularly penetrating philosophical mind—this is no mere lament for a bygone age. 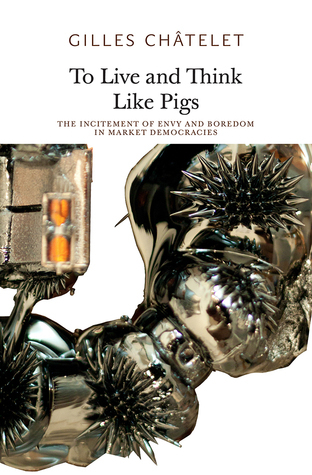 To Live and Think Like Pigs is the story of how the perverted legacy of liberalism, allied with statistical control and media communication, sought to knead Marx’s ‘free peasant’ into a statistical ‘average man’—pliant raw material for the cybernetic sausage-machine of postmodernity. Combining the incandescent wrath of the betrayed comrade with the acute discrimination of the mathematician-physicist, Châtelet proceeds to scrutinize the pseudoscientific alibis employed to naturalize ‘market democracy’. As he acerbically recounts, ‘chaos’, ‘emergence’, and the discourses of cybernetics and networks merely impart a futuristic sheen to Hobbesian ‘political arithmetic’ and nineteenth-century ‘social physics’—a tradition that places the individual at the center of its apolitical fairy-tales while stringently ignoring the inherently political process of individuation. When first published in 1998, Châtelet’s book was a fierce revolt against the ‘winter years’ and a mordant theory-science-fiction of the future portended by the reign of Reagan-Thatcher-Mitterand. Today its diagnoses seem extraordinarily prescient: the ‘triple alliance’ between politics, economics and cybernetics; the contrast between the self-satisfied ‘nomadism’ of a global overclass and the cultivated herds of ‘neurolivestock’ whose brains labour dumbly in cybernetic pastures; the arrogance of the ‘knights of finance’; and the limitless complacency and petty envy of middle-class dupes haplessly in thrall to household gods and openly hostile to the pursuit of a freedom that might require patience or labour. Mercantile empiricists and acrobat-intellectuals, fluid nomads and viscous losers, Robinsons on wheels, Turbo-Bécassines and Cyber-Gideons…Châtelet deploys a cast of grotesque ‘philosophical personae’ across a series of expertly-staged set-pieces: from Hobbes’s Leviathan to Wiener’s cybernetics; from the ecstasies of Parisian nightlife to the equilibrial dystopia of Singapore’s ‘yoghurt-maker’; from the mercantile empiricist for whom the state is a glorified watermelon-seller to the coy urbanite with a broken hairdryer; from the ‘petronomadic’ stasis of the traffic jam to the financier chasing the horizon of absolute volatility; from the demonization of cannabis to the fatuous celebration of ‘difference’. To ask other readers questions about To Live and Think Like Pigs, please sign up. A fierce attack on neoliberal societies. As Châtelet said in an interview somewhere, he intended to piss his readers off. The essay's main instrument is rhetoric, so there's plenty of quotable lines but sadly not that much substance. I'd love to hear more about the misuse of mathematics in contemporary economics. That's something one would expect from a philosopher of mathematics like the author, but I guess it wasn't the main idea for this essay. And it's true, some of the subtle references to A fierce attack on neoliberal societies. As Châtelet said in an interview somewhere, he intended to piss his readers off. The essay's main instrument is rhetoric, so there's plenty of quotable lines but sadly not that much substance. I'd love to hear more about the misuse of mathematics in contemporary economics. That's something one would expect from a philosopher of mathematics like the author, but I guess it wasn't the main idea for this essay. And it's true, some of the subtle references to French culture make fragments of this book very opaque. Still, a few chapters here are really resonant and worth reading in 2017. Gilles Châtelet était un mathématicien et philosophe français.